I didn’t build the Grid App or Split App templates yet, since there is a lot of code there. I also haven’t ported any of the item templates. Now that I have the Navigation App template done (which includes an empty Page Control), the Grid and Split and other item templates will all flow from there (eventually : ). // Define the constructor function for the PageControlNavigator. The common pattern for a module that contains private and public parts is to use a self-executing anonymous function (which wraps all the code in navigator.js) to make everything private and then to use helpers to expose public parts explicitly (like the use of WinJS.Namespace.define). Further, to define a class is a matter of gathering up a constructor function with a set of member properties and functions, which is what the WinJS.Class.define helper does. Finally, right in the middle of that is the exposing of a namespace-wide property called Application.navigator, which makes it available to anyone using the Application namespace. // This is the currently loaded Page object. The use of the TypeScript lambda syntax is both shorter and works better when it comes to your intuition of what the “this” keyword means. This is the TS way to do “include” or “import” of code from other TS files, instead of relying on an HTML container to pull in the right files. The WinJS sample I mentioned earlier (Encyclopedia) provides a number of declaration files that provide type information for the HTML DOM, the WinRT object model, jQuery and for WinJS. Unfortunately, the one for WinJS is far from complete, which meant that a lot of the work I did to get the Win8/TS templates compiling without warnings was augmenting that file. All of the declarations files needed to make the templates compiled as generated are provided in the “declare” folder, but I’m sure there are holes that you’re going to run into as you add your own code. Of course, the authoritative winjs.d.ts file is part of the TypeScript distribution, so I’ll work with the nice folks on the TypeScript codeplex project to get my changes merged in. 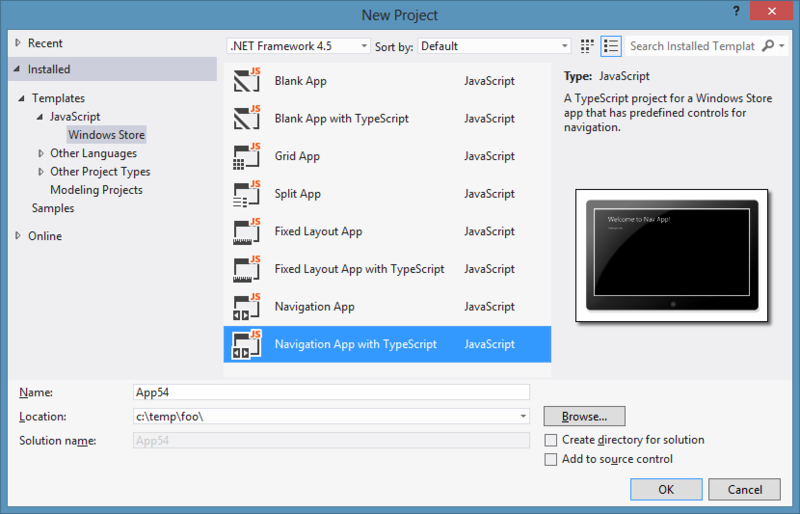 To get started using the Win8/TS templates I’ve built, you’ll first need to install the TypeScript plug-in for Visual Studio 2012. Currently these templates have been tested under TS 0.8.1.1 only and the generated .jsproj files have this path hard-coded in. The web-based HTML Application with TypeScript template uses some trick to do away with hard-coded paths that I have yet to figure out. Once you’ve completed those steps successfully, you should see three new TypeScript-based templates as shown in the very first figure of this blog post. Enjoy.